Maps.com has over 3,500 maps. Iceland, land of fire and ice, is one of the most unusual tourist destinations in the world. 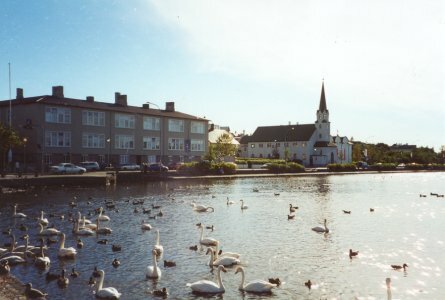 It is Europe's most western country and lies in a strategic location in the North Atlantic, just south of the Arctic Circle. 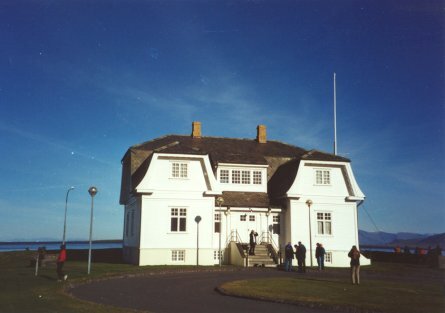 Previously a Danish possession, Iceland became fully independent in 1944. Most settlements are along the coast to ensure that ports remain ice-free in the winter. Ice you can understand. But why fire? This is because the country lies on the rift where the North American and European continental plates are pulling apart. This gives rise to some 200 volcanoes plus numerous geysers and solfataras. Doesn't that sound an interesting place to live? Iceland is a really cool place to go! Bear in mind, though, you might not see any ice - unless you go in the winter. So let's clear up a few things first. If you want ice, best go to Greenland, and if you want some green, best go to Iceland. Strange how people get such important things wrong, isn't it? (Still, these early settlers weren't well travelled, like the rest of us.) Although, to qualify the 'green' in Iceland, let it be said that 'green' is few and far between! (Yet it is always there, in spirit.) Apart from where it is cultivated and well tended, grass is something that can only survive on the volcanic dust until the elements tear if off! This is very clear in some parts of an otherwise lunar landscape, where odd patches of grass cling on for dear life and you can see where neighbouring grass has just been uprooted and is 'gone with the wind'. Often you can see the white of a glacier on the horizon. Let's clear up a few things first. If you want ice, best go to Greenland, and if you want some green, best go to Iceland. They say that the first rule of survival in Iceland is this: If you get lost in a forest, stand up! Or dream, perhaps! 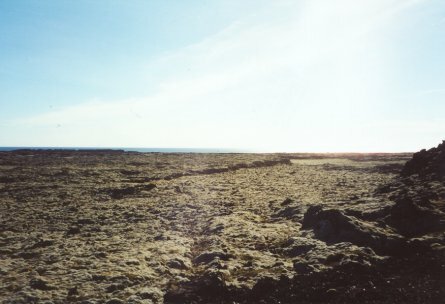 Iceland is, in the main, very flat, so you can generally see where you are heading: across the lunar landscape. Finding trees is quite difficult, although they're keen on putting them around cemeteries. Therefore, if you get lost in a forest in Iceland, you are probably in a cemetery! You'll be with others who are dead lucky! Originally, and I suspect Icelanders might keep quiet about this, woodland once covered large areas of the island, but the early settlers took care of this. (Pity they didn't build with rock!) Now, reforestation is much talked about, but it will take some time ... and lots of effort! Having mentioned that there are many places on Iceland where you might suppose you were on the rocky landscape of the moon, it would be wrong to imagine that it was just like Lanzarote! While it is also formed from solidified volcanic eruptions, Iceland is at the other end of the temperature scale, and is a might higher on the globe! While being far from the most northerly outpost within Europe (Norway and Sweden beat it there by miles), it is the most westerly. (Row due south from western Iceland and there is a clear course to Antarctica!) It does, however, nestle up to the Arctic Circle. That's why it is a cool place to visit or to live! Not surprisingly, therefore, Nature has something different in store for it than endless sun, although it is warmer than many imagine. 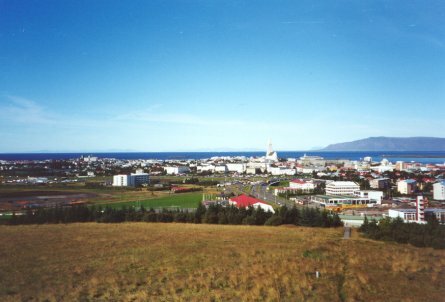 The average temperature in Reykjavik is -0.5°C in January and 10.6°C in July: heady stuff! Iceland is different from other countries in many other ways. Here's an unusual way to be different, for example. Most countries have to revert to plain and simple hostilities in order to extend their borders. Not so Iceland. Being located on the mid-Atlantic Ridge, the boundary of two or the earth's tectonic plates, the country is getting larger all the time as these plates grind and pull apart: by a few centimetres every year! This could just be why Iceland experiences around 400 earth tremors a day! Where the plates separate, the earth's crust is replenished by magma flowing up from the depths to fill the gap. (Not that you're likely to even notice anything on a short visit.) On the night of 23 January 1973, however, no one had a good night's sleep in town, and 5,500 inhabitants had to be rapidly evacuated to let the Heimaey eruption let off steam (smoke and fire, to be more precise). I mentioned the erosion of the wind earlier, but there are other factors of nature that continually mould this place: rain, frost, ice and the ocean. 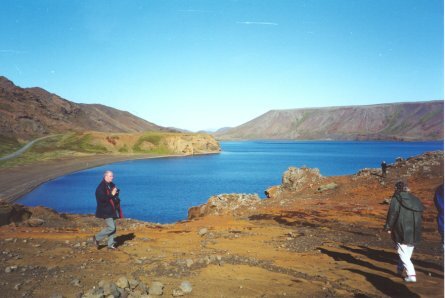 Its glaciers hollowed out the fjords and carved out the mountains in the north, east and west - OK, so it's not all flat - and they also covered the volcanic zones, giving rise to formations not found anywhere else on earth. Ice acted as an inhibiting force on the lava flows and limited the spread of ash, creating bizarre mountain formations as suddenly cooled magma formed rocks with names like palagonite tuff and pillow lava. Pick up some of the rock and you'll be amazed at how light it is. Although Icelanders live in the shadow of Nature, rather than fight the elements, they respect and live in harmony with them. The countless geothermal springs are harnessed to provide power and hot water for heating. 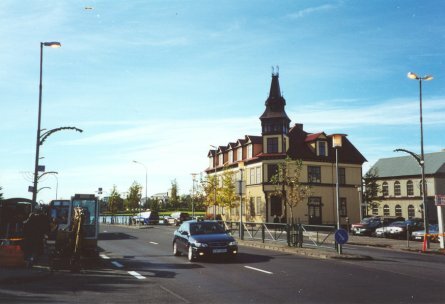 Within Reykjavik, for example, you will see many mysterious cabins. These are capped well-heads, and the hot waters gushing forth f rom them are mixed to create the desired temperatures and pressures and are then fed off to heat domestic buildings! 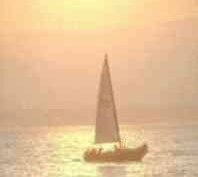 (To you and me, that adds up to free energy, folks!) 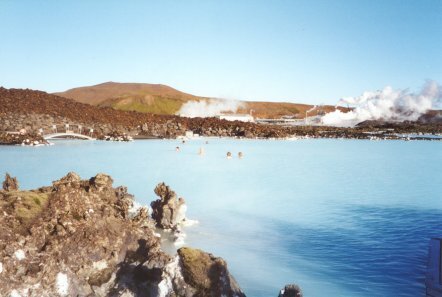 Others, like those by the famous Blue Lagoon, are also used by power stations. At the Blue Lagoon, it is the power station's waste water that is used to provide the ethereal bathing pool that steams amidst either the lunar landscape or the snow and ice, depending upon season. (You don't swim in the sea here!) In the picture you can see the power station in the background, and any blobs you see in the blue water are people's heads! (I got all steamed-up trying to pick a good picture of the lagoon from the few I took. Sorry, folks, this is the best I can do. The colouring seemed to defy a good picture.) So while you might shiver getting from the building into this outdoor pool, the temperature within the pool is HOT. It is hotter than many people would have in their tubs at home! This steaming pool was a surreal experience that I think I will never forget. Just outside Reykjavik there is a place known as Perlan (The Pearl), comprising a series of large hot water storage cylinders, upon which has been build a rotating restaurant and viewing balcony, offering good views over the capital and the surrounding countryside. (Yes, that is a ring of trees on the edge of the city.) 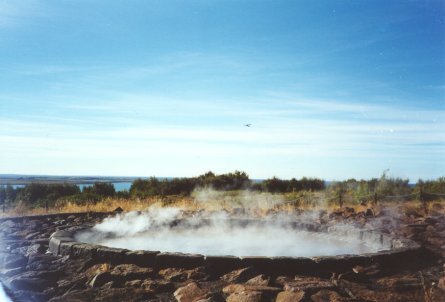 Nearby is a small geothermal pool that, even on a relative warm day, steams away merrily to itself, as you can see in this picture. Way out in the wilds - less than one hour's drive from the capital - you can travel a rough 'summer-road' (like many of Iceland's roads, it is closed in the winter) to see some of the lunar-like landscape, chemically-laced lakes, bubbling murky mud-pools, and inspect the left-over rocks from quarrying. Glaciers, with their immense weight, crush and grind rocks, and glacial tongues and rivers convey the resulting mixture to lay natural mosaic surfaces. You need time to go out on special trips from the capital to really see Nature, however, and guides that know where to take you and what to show you. Just look at this natural mosaic! Despite being 'on the edge of civilisation', or perhaps because of this and its general (and wise) detachment from world politics - don't mention the 'cod wars' - the little clapboard cottage at Hofdi is an image known throughout the world as the place where the famous US and Soviet peace summit took place. Outside you can find some presentable grass! Icelanders are among the healthiest people in the world, incidentally. Could it be all that clean air? Could it be all that fish in their diet and the Omega-3 oils? Or could it be that compulsory health insurance allows many medical services to be offered at minimal cost, with free hospital care? 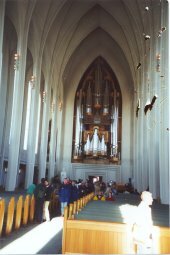 Education is also free, by the way, and there is a university at Reykjavik. Reykjavik is a good place to get stung, by the way! Watch out for prices in the stores and eating places ... and watch out for wasps! I was stung taking the left-hand picture next to the flamboyantly modern City Hall - so forgive the camera-shake! (To be fair, I had just finished a sticky-bun, but why this wasp boldly attacked me rather than my bun I shall never know. I was minding my own business taking the picture, after all.) This lake freezes over in winter - except for an area in this corner, where warm spring water ensures there is always liquid water for the resident swans, ducks and geese. 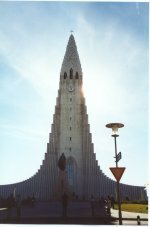 If you go here, do go inside the City Hall and descend to the lower level at the rear to see the huge relief model of Iceland. (Pity it does not put any named features on it, though.) Some rooms within this building are actually under water! The non-watery picture shows one of the more modern streets in the capital, and gives you an idea of the architecture. This place is not large, by the way, and you can easily stroll around the centre on foot. Finally, take a look at the right-hand picture, taken inside the church, facing backward towards the impressive organ. I thought you might be interested in this since it appears to show my guardian angel in the foreground. Another strange feature, hard to see, but never-the-less present, are strange flying objects way above the angel's head. (Click the picture if you want to work this one out!) On the original they look like orbiting Icelandic rocks. What a mysterious place Iceland is, to be sure! If you enjoyed reading the above article then you will probably also enjoy Tunisia by Ed, and Uppsala in Sweden, also in Europe, and our latest articles covering the Orinoco Delta, La Mata, Marbella and Beijing.